Love and Saint Augustin 1929. Love and Saint Augustine. Edited with an Interpretive Essay by Joanna Vecchiarelli Scott and Judith Chelius Scott. Chicago: The University of Chicago Press 1996/1998. The Origins of Totalitarianism. Harcourt, Brace & Co., New York 1951. Second enlarged edition: New York: World Publishing Co., Meridian Books, 1958. Third edition, with new prefaces: New York: Harcourt, Brace & World, 1966, 1968, 1973. The Burden of Our Time. Secker and Warburg, London 1951. Elemente und Ursprünge totaler Herrschaft.Europäische Verlagsanstalt, Frankfurt a. M., 1955, 1958, 1961, 1962. Ideology and Terror: A Novel Form of Government. Published first in The Review of Politics, Vol. 15, No. 3 (Jul., 1953). Totalitarismin synty. Vastapaino, Tampere 2013. The Human Condition. University of Chicago Press, Chigaco 1958. Vita activa oder vom tätigen Leben, Kohlhammer, Stuttgart 1960; Piper, München 1967. Vitaactiva. Ihmisenä olemisen ehdot. Vastapaino, Tampere 2002. Rahel Varnhagen: the life of a Jewess. Translated by Richard and Clara Winston (1958). Complete ed. ; Ed. Liliane Weissberg. Baltimore: Johns Hopkins University Press, 1997. Rahel Varnhagen. Lebensgeschichte einer deutschen Jüdin aus der Romantik. Piper, München 1959. Von der Menschlichkeit in finsteren Zeiten. Gedanken zu Lessing. Dr. Ernst Hauswedell & Co. Verlag, Hamburg 1960. Von der Menschlichkeit in finsteren Zeiten. Rede über Lessing. Piper 1960. On Humanity in Dark Times: Thoughts about Lessing. In Men in Dark Times. New York: Harcourt, Brace and World, 1968. Between Past and Future: Six exercises in political thought. New York: Viking, 1961. 2. The Concept of History: Ancient and Modern. Two more essays were added in 1968. 8. The Conquest of Space and the Stature of Man. On Revolution. New York: Viking, 1963. 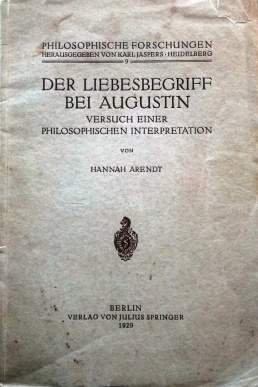 Revised second edition, 1965. Über die Revolution. Piper, München 1963. Eichmann in Jerusalem. On the Banality of Evil 1963. Eichmann in Jerusalem: A Report on the Banality of Evil (1963/1968) New York: Viking, 1968. Eichmann in Jerusalem. Ein Bericht von der Banalität des Bösen Piper, München 1964. Eichmann Jerusalemissa – Raportti pahuuden arkipäiväisyydestä. Docendo, 2016. Men in Dark Times. New York: Harcourt, Brace and World, 1968. Angelo Giuseppe Roncalli: A Christian on St. Peter’s Chair from 1958 to 1963. Karl Jaspers: A Citizen of a World? On Violence. Harvest Books 1970. Crises of the Republic. New York: Harcourt Brace Jovanovich, 1972. Life of the Mind Ed. Mary McCarthy, 2 vols. New York: Harcourt Brace Jovanovich, 1978. Vom Leben des Geistes. Bd. 1 Das Denken; Bd. 2 Das Wollen Piper, München 1979. Denktagebuch 1950 – 1973. Piper, München 2002. Die verborgene Tradition. Acht Essays (1932–1948) Suhrkamp, Frankfurt a.M. 1976. The Jew as Pariah: Jewish Identity and Politics in the Modern Age, edited with an introduction by Ron H. Feldman 1978. Essays in Understanding, 1930-1954: Formation, Exile, and Totalitarianism, Ed. Jerome Kohn. New York: Harcourt, Brace, 1994. Responsibility and Judgment. Edited with an introduction by Jerome Kohn. New York: Schocken, 2003. The Promise of Politics. Edited with an Introduction by Jerome Kohn. New York: Schocken, 2005. The Jewish Writings. Edited by Jerome Kohn and Ron H. Feldman. Schocken Books 2007. Reflections on Literature and Culture. Stanford University Press 2007.